My choice of the next writer having won a Nobel Prize for Literature was guided by a desire for a feminine touch with a modern writing allure. 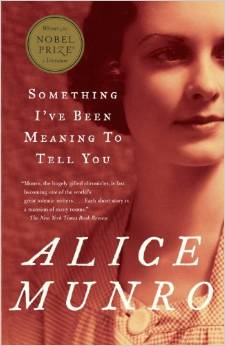 I gladly learned that in 2013 the Nobel Prize was awarded to Alice Munro, a Canadian writer. She was awarded the prize cited as a “master of the contemporary short story”. She is the first Canadian and the 13th woman to receive the Nobel Prize in Literature. The title of the book caught my attention by the mistery the word “something” implied. This book is a collection of 13 short stories first published in 1974. I am not a fan of short stories as they almost always leave a “so what’s next” question unanswered. Alice Munro stories, by contrast, give a clear sense of the story’s end, some even too abrupt to my taste. Some stories are personalized and presented as the author’s own experience, some have feminine characters, ten year old girls, teenagers, married women, seniors. Of the 13 stories, I liked most the “Forgiveness in families”. It passes on the message of practicing tolerance and compassion with members of the family, who willingly or unwillingly push our buttons. It is the story of a relationship between a brother and a sister, whose life’s views and lifestyles clash. Their mother’s sudden illness brings them together in the most unorthodox way. The story left a sunny print on my beliefs about siblings’ relationships. On many occasions, I caught myself thinking that the writing did not do justice to some of the feminine characters by letting them live in a state of confusion, endless search of self, or an exacerbating dependence on a male love. For instance the character in “The Spanish Lady” whose husband of twenty years got a mistress, her best friend. The character’s daughters are gown up and experience their lives while she feels empty and betrayed to a level of finding an imaginary admirer meant probably to reassure her feminine self worth. While far from contesting the presentation of the author’s reality, I would have liked the fiction to be a bit more up-lifting and serene. In the last story “The Otawa Story” the author herself seems to acknowledge this and do justice to her characters.